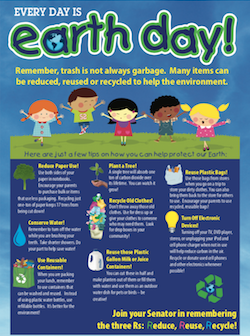 The Earth Day Celebration is for school children in grades K-6 from every corner of New York State. The Senate’s goal is to encourage children to develop an awareness of the environment and its resources. Teaching children about the importance of recycling and waste reduction is critical as we face the environmental challenges of the 21st Century. OUR Theme: Reduce, Reuse, Recycle. The Senate’s focus is to emphasize the importance of recycling and waste reduction, to encourage the exchange of ideas about recycling and waste reduction among schools, children and adults and to stimulate creative thinking about solutions to problems concerning recycling and waste reduction. We are asking students to create a poster that could be used as part of this campaign. Deadline: All submissions must be uploaded to the website by April 17, 2019. Instructions: Please fill out your class and school information first, and then enter ALL your students on this form. Entries should be photographed and submitted electronically, preferably in jpeg or pdf format. Please enter each student individually, we can not accept a single pdf with all your students grouped together. Thank you. Start typing your school's name and choose from list (you must CLICK ON NAME in drop down). If your school does not show up, please contact us.